Cat urine odors and stains are very unpleasant, and the problem arises from a variety of causes. Leaving cat urine on the carpet, drapes, linens, or clothing is your pet’s way of informing you that something is wrong. This something might be a bladder infection, a new anxiety, lack of human attention/affection, the need to assert dominion by marking territory, or the inconvenience of having to travel too far to the litter box. Treating symptoms (cleaning cat urine stains and deodorizing) without correcting the real cause is probably counterproductive, a waste of time, and perhaps even foolish, because the cat will go on leaving you messages. However, if you don’t get rid of the stain and odor as soon as possible, the urine can set into the fibers, making the smell more or less permanent and exacerbating respiratory conditions. So, we’re going to show you 3 straightforward steps to follow to rid your house of dry cat urine stains. You are likely to have already most of the products you’ll need, but we encourage you also to get an ultraviolet cat urine light. This tool will help you verify that you have found all the stains and that you have extracted all the urine from each stain. 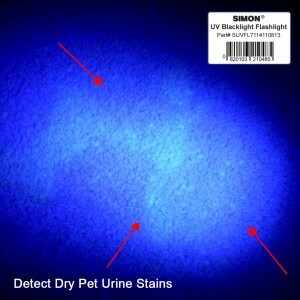 However, a UV pet urine detector works best on dried areas. When the cat’s accident is still wet, the salts and proteins that glow under ultraviolet light are diluted and hence less concentrated than after drying. The flip side is that stains are much easier to smell and to see with the naked eye when in liquid form, facilitating blotting and cleanup when you have caught the problem shortly after it happened. But you can’t always catch the problem in time. If days or weeks have elapsed, the odor may have weakened enough that you don’t even realize there is a problem. And in those cases when you do catch the accident and clean it up, you may not succeed in removing all of it. And just because you can’t see or smell an old urine stain doesn’t mean your cat can’t, whose sensitivity is greater than yours. 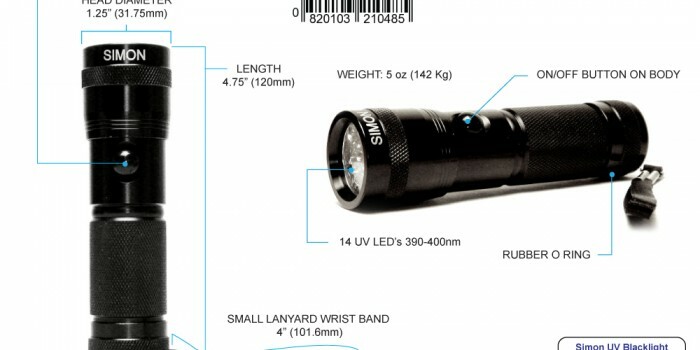 This is why we recommend using an LED UV flashlight. You want to know there are absolutely no traces of cat urine in the house. Our steps thus apply primarily to dried urine stains, upon which the pet urine light is most effective. With low ambient natural light and no artificial light, shine your UV cat urine flashlight on all carpets, rugs, drapes, linens, and clothing. The amino acids in any (dried) stains will glow amber under the ultraviolet light. Devise a way to mark the spots so that you can recognize them in white light. Thoroughly clean those spots. Clothes and other portable items can be washed or dry-cleaned. For carpets and the like, the best substance to use is an enzymatic cleanser because it actually eats the urine, but lacking that, try a vinegar and water mixture in a 3:1 ratio. Now you want to rinse and extract everything, ideally using a wet vac. After the spots have dried completely, liberally sprinkle on baking soda, which is great for absorbing odors. Your aim here is to eliminate all temptations for your cat to pee there again. After an hour or so you can vacuum it up. Now, just to make sure, use your UV blacklight flashlight to go over all cleaned areas again. If you still see that amber glow, repeat the process. Hopefully you have succeeded in removing all traces of cat urine and can concentrate on tending to the reason’s behind Fluffy’s fall from grace. Can someone with experience explain or answer: What about spots that are indeed DRIED URINE, but where the animal routinely urinates wet fluid OVER dry spots, will it fluoresce? It depends ALL on Your Pets Diet. If your pet keeps hitting the same spot, then it is not likely to be seen. Your pets diet has a lot to do with it. If they drink a lot of water, then the water will dilute the proteins and then fluorescence will not crystallize so you would be able to see the spots under the UV light. That is if you are feeding them High Protein foods without any grains or fillers. The higher quality of food and the water intake play a major role in detecting your pets urine spots.